Amazon Prime has a ton of benefits (more than just free two-day shipping), but are you using them all for your $119/year? Here is a list of what you might be missing out on. 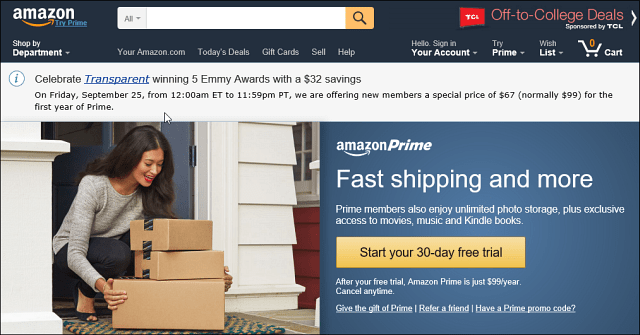 Amazon Prime has a ton of benefits (more than just free two-day shipping), but are you using them all for your $99/year? Here is a list of what you might be missing out on. Unlimited Photo Storage via the Amazon Desktop, Mobile App and Fire devices. Kindle Books: Choose one featured early release book for free every month with Amazon First Reads. To start sharing, sign in to your Amazon account. Once signed in, go to “Manage Prime Membership”. Click on “Invite, a household member.” Then enter your birthday as well as enter the name, relationship, birthday and e-mail address of up to four people you’d like to share your free shipping benefits with. Music — yes music. It’s not as popular as Spotify. Still, it is free. Also, if you purchase a CD, you get the digital copy as well with what the company calls AutoRip. Prime Members are eligible for exclusive savings on Physical Video Games starting in the Pre-Order phase until two weeks after release. Prime Now – Get free two-hour delivery on over 10,000 items. You can also get free restaurant delivery as well from popular hot spots. And I would be remiss if I didn’t talk about the huge online library of movies and TV you get with Amazon Video. This includes shows from HBO like Six Feet Under and The Wire. These are older shows, but free for Prime members. You can even download the video content now to your various devices. Amazon customers can make one simple change when shopping at Amazon and 0.5% of all purchases will be donated to their favorite charity. Free Release-Date Delivery: FREE Release-Date Delivery on eligible pre-order items delivered on their release date to ZIP codes within the U.S.
Twitch Prime: Members receive exclusive promotions on eligible pre-order games. Twitch.tv users who link their Amazon Prime account get a free Twitch channel subscription every month. And for even more about Amazon and the Echo with Alexa, check out our archive of Amazon articles. Did I miss any? Leave a comment below and let us know your favorite Amazon Prime benefits people might not know about. Free shipping and Amazin Music is what I’m doing now… Cancelled Pandora. Question about the mp3/movie credits: Is there an easy way to check your credit balance and their expiration?